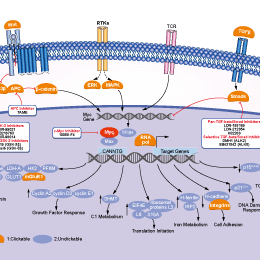 10058-F4 is a c-Myc inhibitor that specificallly inhibits the c-Myc-Max interaction and prevents transactivation of c-Myc target gene expression. Immunoblot analysis of HER2, P-AKT, and HOXB7 in BT474 cells after treatment with 10 µM 10058-F4, 100 µg/ml of trastuzumab, or a combination of 10058-F4 and trastuzumab. 10074-G5 is a c-Myc inhibitor that binds to and distorts the bHLH-ZIP domain of c-Myc (Kd = 2.8 µM), thereby inhibiting c-Myc/Max heterodimer formation and inhibiting its transcriptional activity (IC50 = 146 µM).